TwelvePoint is an editor and content manager for writing, sharing and publishing scripts and novels. 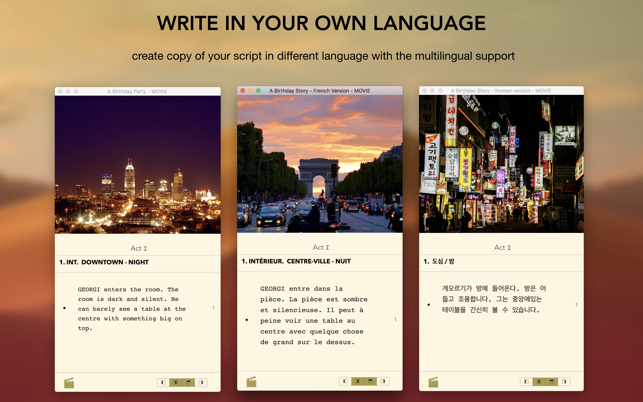 Write and publish in an instant with your style (Hollywood, Bollywood, French, Korean, Italian or create your own). 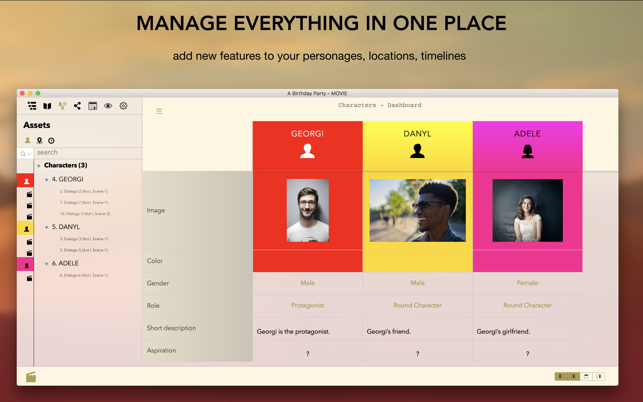 From concept to final draft, manage characters, locations and dates, all in one application. In any language, regardless of the alphabet used (e.g. English, Russian, Korean, etc. ), the paragraphs are automatically paginated according to the selected style. The text is managed separately from the layout. You can send your scenario to different production studios (e.g. Hollywood, French, etc.) instantly without changing the screenplay. 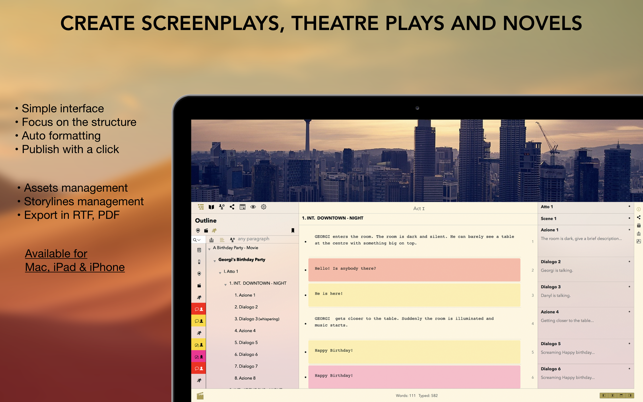 Designed to support novice authors, it provides professionals with a sound and solid new multidimensional environment for writing scripts. Different types of screenplays are supported (Film, TV Series, Theatre and Novels), at any time, you can switch from one type to another without any problems (e.g. starting from a novel to write a screenplay for a film or vice versa). Do you have an idea for a film, a television or theatre show, a novel? 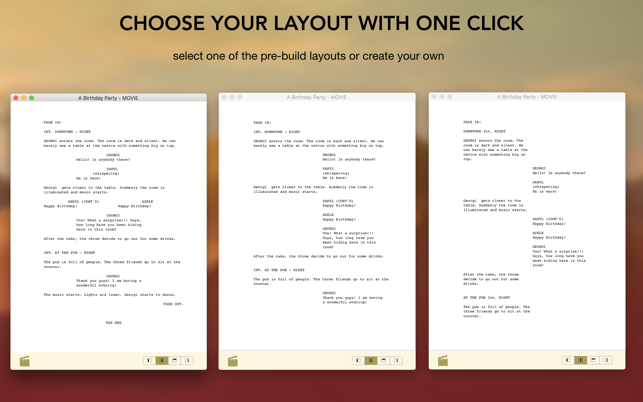 Select the type of screenplay and start writing! Start writing from the beginning like a professional. Page layouts are available for movies, TV shows, theatrical performances and novels based on the most common publishing styles (American, Korean, French, Italian). 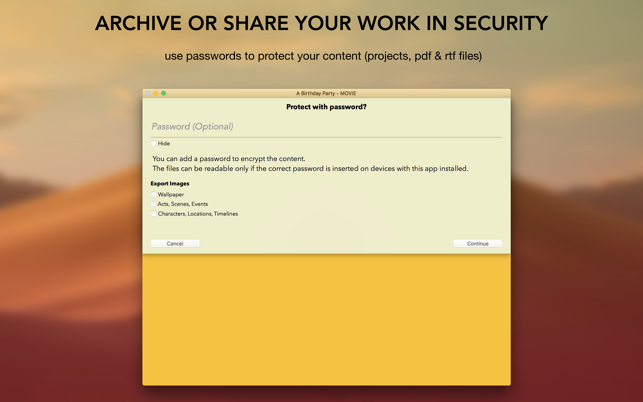 In addition, you can create new ones and share them with your co-workers. 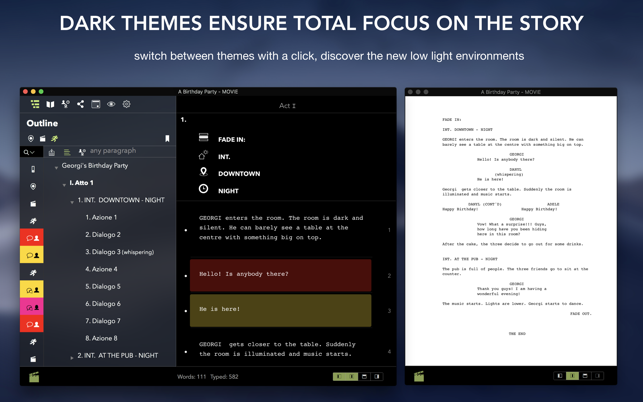 The interface adapts to your needs, giving you a way to focus on the story. Choose how much information you want to view and what information you want to display. Use full-screen mode to immerse yourself in the story without additional distractions. Create your own plot, add actions and conversations, mark notes, change the order of acts, scenes, or paragraphs, all in one gesture. Review everything quickly in read mode. Create your own characters, places, dates, add features, details, and notes. 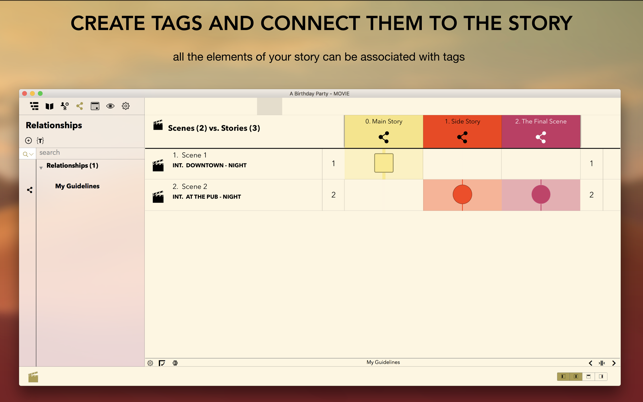 Filter the story by roles, places, spoken text, characters, etc. Add depth to your story by introducing new elements such as secondary stories, additional character features, guidelines, guidelines, resource costs, and more. Import existing scenarios in text format (RTF, doc, docx, html, unformatted text) and manage them through the application as if they were native projects. 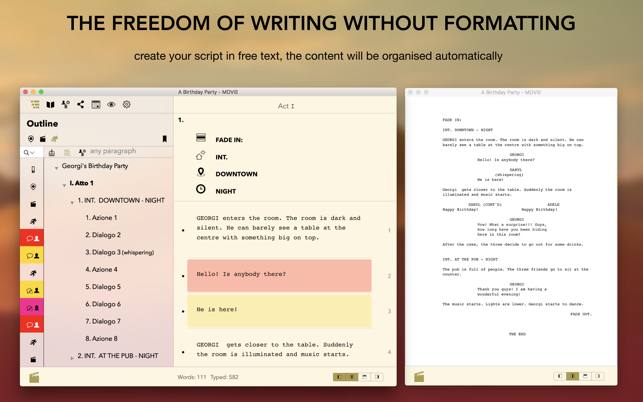 If you prefer to write your screenplay only in text mode, this is also possible. All scene elements (headers, dialogues, new acts, etc.) will be translated and organized automatically. 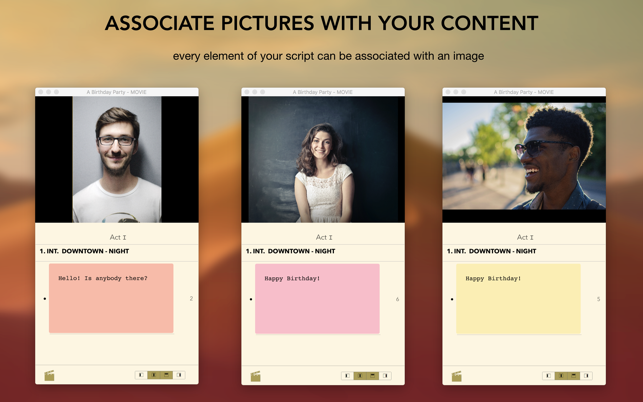 Create and share reports to assess the cost of the screenplay, the use of characters, and more. - Cover: The first page with the author's title and details can be easily configured and is automatically generated in each publication. - Supported Formats: All scripts are created by default in PDF and Rich Text Format (RTF). Documents can be shared via email or saved locally. When your draft ("Speculative Screenplay" or "Spec") is ready for the market, you can use Hollywood's style-based review mode to allow your co-workers to add or omit scenes or paragraphs. - Solved an issue in renaming custom assets' features. - General stability improvements and user interface tuning. I use all the writing apps FD, Scrivener, Highland, Slugline, iA Writer etc. This one has potential, but it's launched too early, it's just not ready, it should be marked 'Beta' to help the developers make it useable. Concept great. There is no chance for me, a prolific use of writers apps to understand how this works - Developers, please get this to the next phase, test it, because even though I went through your video instructions, I was no closer to getting it. Pluse the videos were poorly made in terms of context and all 'how to's' where very foggy. I really hope you pull this off! Thank you for your comments, we found this useful and we will implement additional usability functionalities in the upcoming releases. Meanwhile, please note that the videos are just some "quick and dirty" overview of the app basic functionalities. Mostly coming from user request to quickly work on specific topics. One place where you can access more details information about the functionalities is the HELP menu in the app. Also, on iBooks (accessible via the home page on our website: www.twelvept.com) there is a book you can download for free (whether you purchased the app or not) that contains detailed information of TwelvePoint for both iOS and macOS version (shortcuts, gestures, etc.). The guide book contains also some specific user case scenarios and advanced topics on how to bring the planning of a story to the next level. I don’t understand this app at all, was looking to get an inexpensive screenwriting tool and now I regret spending the money on this. I would skip this one. sorry. So that we can help you going through your first steps with the app. Please notice that on the app itself there is a step-by-step tutorial (under the help menu) with text and videos. You can also download "Introduction to TwelvePoint" from iBook library for free in which use cases are described in detail. Do let us know, how can we support better. Copyright © 2018 morepaths.com. All rights reserved.